One of the difficult things about this series of posts has been (and will continue to be) that I don’t really want to write in-depth Photoshop tutorials, most of which already can be found in about 10 seconds on Google, and also that I’m not too keen on doing videos, since I don’t like the way I sound. This means that, at times, this isn’t totally a step-by-step guide to what I did to edit an image. I think in lieu of doing that, I want to share those steps, but hone in on one particular step that I think was critical to a particular photo. I hope this works for you all, too. For this series of posts, I’m definitely focusing on my photos where I do more post processing (what would be the point, if not? ), even though most of my editing is accomplished by applying a preset in Adobe Camera Raw, and then applying a curves adjustment layer and color balance adjustment layer in Photoshop. In other words, some steps won’t be covered here in excruciating detail, but you could probably obtain a 95% result on the same (or similar) photo with a lot less time in post processing. This is a technique I learned about a couple of weeks ago that I feel has really helped me add some punch to my photos, especially in cases where I’ve extended the dynamic range of a single photo. For a detailed description of it and step by step screenshots, take a look at this post. The process itself is actually pretty easy. After opening (or editing) your photo, you Alt/Option+click the “New Layer” icon in Photoshop, then in the dialogue box that pops up, change the blending mode to Overlay or Soft Light, and then click the checkbox below to fill with 50% grey. I prefer soft light mode as I feel it’s a bit…softer, but that could all be in my head. You’re then given a new, grey-looking layer. I have all of this set to go as an Action. With the white and black brushes, you can paint on this layer to, effectively, dodge (white brush) and burn (black brush). You can change the opacity of the brushes to control just how “hard” you’re dodging and burning, and can really change the range of light in various parts of the photo. It’s a way for increasing the dynamic range, but also the contrast, brightness, and overall moodiness of the photo. Pretty easy process, right? Let’s apply it, along with my other edits to the photo. 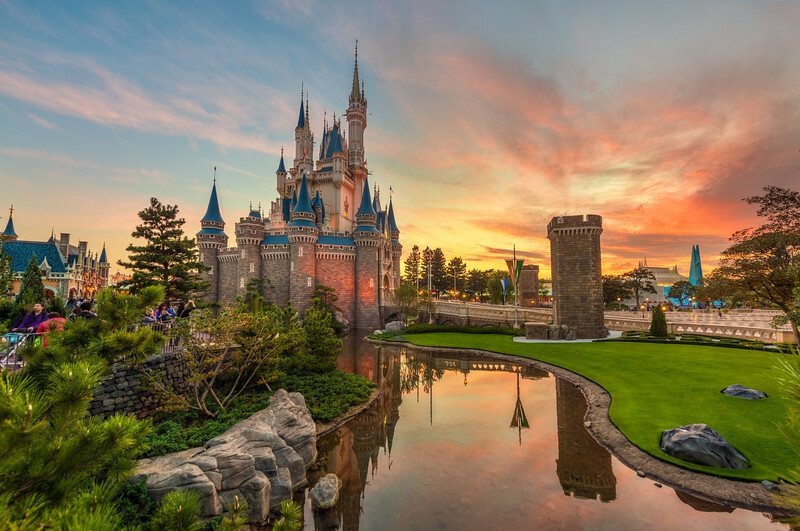 This photo is of Cinderella Castle at Tokyo Disneyland during one stunning sunset (that just didn’t quit!) last October. For this photo, I used my Nikon D810 and Nikon 14-24mm f/2.8 lens. I didn’t have my tripod with me, as they are typically not permitted at Tokyo Disneyland, so I shot handheld. First, let’s cover shooting the photo. During sunset, I typically bracket everything. This is for two reasons: 1) because there’s more dynamic range than a single photo can capture; and, 2) because sunset is fleeting and I want to move around and take as many photos as possible, and bracketing allows me to use a less precise, “run and gun” approach. Since I didn’t have a tripod and the light was fading, I shot in aperture priority mode with Auto-ISO enabled, and a minimum shutter speed of 1/15th of a second and a maximum ISO of 3200. I love the Autio-ISO mode on Nikon cameras as it allows me to set the shutter floor and ISO ceiling, which gives me more control over what is otherwise a semi-auto mode. While I don’t necessarily like high ISOs as they give me less latitude in post processing, I’d rather have a high ISO and a sharp photo. With my choices in the ceiling and floor above, I’m sort of taking a calculated risk. On the D810, even with the 14-24mm lens, a shutter speed of 1/15th of a second is dangerously slow. I have pretty steady hands, but even so, I still find about 50% of my shots handheld have a bit of camera shake. To combat this, not only do I bracket, but I always fire off 3 brackets (so 9 photos) of any scene that I really like. This way, I’m playing the odds that I’ll have at least one series that’s sharp. Since this was a particularly gorgeous sunset, I fired off 15 frames. You can always delete the extras later–unless you’re friends with Doc Brown you can’t retake the shots you missed. The dynamic range here wasn’t tough, and was able to process this with a single raw file, albeit with some post processing help in extending that dynamic range. The edits to the first photo were key, as I applied a standard preset that opened the shadows to 100% (and also opened the darks to +50 in the “Tone Curve” menu), dialed back highlights to -50, increased clarity to +20, vibrance to +65, blacks to +11, exposure to -.05, and contrast to +20. I then opened the photo as a smart object (shift+Open Image) in Photoshop, right clicked it for the “New Smart Object via Copy” dialogue, and then double-clicked that new layer to open it in ACR. For that new layer, I reduced the highlights to 0, the exposure to +.5, and adjusted the white balance to give the photo a cooler look. I then clicked okay to bring this back to Photoshop as a new layer. I’ll cover working with Smart Objects in a future Technique Tuesday, but for now, here’s a closer look at how the process works. Then, using a layer mask on the top layer, I blended in the middle of the sunset from the lower layer, as well as some other portions of the photo. Not only did this allow me to use two “versions” of the same photo in terms of exposure, it also let me use two versions of that photo for the white balance. This worked out well in conveying the color of the sunset, which the camera tends to capture as warmer or cooler across the board, without accounting for as much nuance as the eye can see. Following this, I applied a color balance adjustment to skew more towards red, a vibrance adjustment, and a fairly heavy curves adjustment, backing it down with the layer mask in some areas that became too dark. Both this and the dodge burn method are really important here, as in the processing of increasing the shadows and darks while simultaneously decreasing the highlights, I ended up with a photo that felt a little flat. This is common with both real and pseudo-HDR (the latter being the case here), so it’s important to restore some of the pop to the photo. From there, it was on to the 50% grey layer, and I basically just painted in brighter and darker areas of the photo. The heart of the sunset was my main focus for darkening, and this made it a bit moodier, and also gave additional texture and contrast to the photo. I also darkened the bushes and grass, which I felt had become a little too bright. In the other direction, I lightened part of the sky as well as the main turret of Cinderella Castle. For you Disney photographers out there, this castle turret is always a problem spot with photos like this, and a dark main turret is a telltale sign of aggressive post processing that wasn’t carefully done. You final result is the photo at the top of the post, but you can see the “before” photo in terms of the 50% grey layer and my dodging and burning in the screenshot above. It may not seem like a huge difference at first blush, but once you really look closely at the details, I think you’ll see that it did make a pretty big difference. Hope this technique helps you in your own post-processing! If you’re planning a visit to Tokyo, Japan, please check out my other posts about Tokyo for ideas of things to do (or not do) while there. Tokyo has a lot of things to see and do, so I also highly recommend the Lonely Planet Japan Guide to help better develop an efficient plan while there. To get some more Tokyo, Japan photo ideas, check out my Tokyo Photo Gallery. Likewise, check out my Tokyo Disneyland Photo Gallery. The fact you can take these photos without a tripod is amazing! Used your settings tips when I went to Disney and they helped so much, so I’m definitely going to try out these editing techniques for sure. I’ve never been good with the dodge-burn tool so I’ll give this a shot. Your photography is amazing and you’re awesome for sharing them with us! Thanks! I’m not a photoshop user (yet), but I do use Lightroom. This still gives me some great info and ideas. Are you at all inclined to sharing some of your basic ACR preset concepts? I know you do far more than that, but I think a lot of people would find it interesting to know the basics of how you address different types of images from the start. Curious to know what RAW file setting on D810 did you use for those 9 bracketed frames? sRAW? or 14-bit compressed? uncompressed? Another great post Tom! I only recently discovered the Dodge and Burn tools but have yet to put them to great use both at work or in my own time. It’d be great to see a before and after of your images to see the comparisons! Great post! Thanks for doing these post-production posts. Thanks! This was probably the most beneficial technique post yet for me. A couple questions, if I might: Could you accomplish a lot of the same thing in regards to dodge/burn with the Lightroom adjustment brush? Also, when you bracket the sunset like you did above, how many stops of bracketing do you typically use? I’m not a huge Lightroom fan as a one-stop shop unless you’re a sports photog, wedding photog, or someone else doing a lot of bulk processing (for trip reports, food photos, or other ‘dull’ stuff, I use ACR exclusively quite often). If you want more control and to take more time to get a good landscape shot ‘just right’, you really need to use Photoshop. The control and precision of working with layers is unparalleled. At the end of the day, though, you can likely accomplish 95%+ of the edits in LR if you don’t have the time or aren’t a perfectionist. As for bracketing, it depends upon intensity of the light. If it’s really intense, 2 stops. If it’s fairly tame, 1 stop with the idea that I won’t be merging them into HDR, but rather that the 1 stop is my margin of error so I don’t have to fixate on settings.